Home / Skin Care / POUT IT ! Inspired by the virtuoso of makeup Namrata Soni, this blend is specially designed to give you perfect plumped up lips for flawless lipstick application and perennial nourishment. 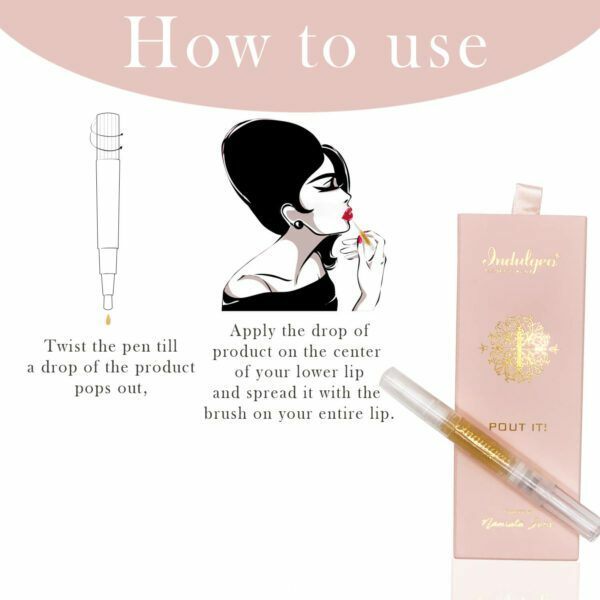 A corsage of vital essential oils for your lips infused with 24K gold flakes, this lip oil is the best way to pamper your pout! 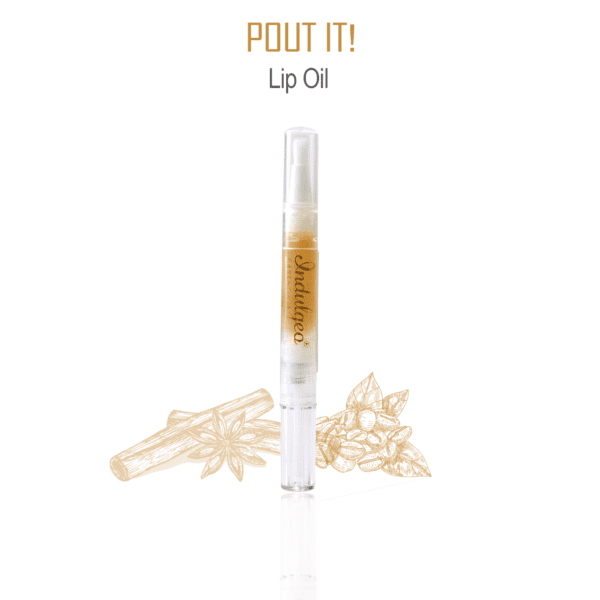 This concoction has Cinnamon Oil, an all- natural lip plumping solution and an exotic blend of edible grade cold pressed oils like Argan Oil, Jojoba Oil, Evening Primrose Oil infused with the finest Jamaican coffee beans and French vanilla pods. It contains the finest quality of unrefined wildcrafted Beeswax which is incredibly moisturizing and is an excellent emulsifier (enabling it to really lock in moisture), so it also has the ability to soothe any pain caused by dryness and dehydration.It also forms a protective layer on your lips that can shield them from harmful UV rays, as well as prevent infections or possible cold sores. With exceptional qualities and high amount of antioxidants, Pout it increases blood circulation, combats harmful effects of free radicals, stimulates collagen production, tones and firm the surrounding lip area, protects from sun damage. All the oils used in this concoction fall under the category of GRAS and are not phototoxic. The convenient click-pen applicator makes it easy to use without the mess.